No issue is on the human mind more than the search for peace. Numerous factors, such as national interest, ethnic rivalry, hunger, the environment, ideology, human nature, and economics, have an impact on world peace. International Journal on World Peace is concerned with all of these. 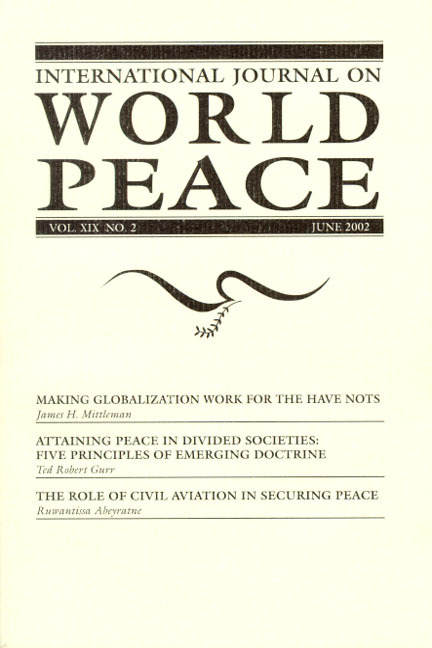 International Journal on World Peace also contains reviews of recent books related to world peace, and is indexed each year. It is abstracted, indexed, or made available on CD-ROM by several agencies. It is a welcome addition to any library. Subscriptions are $35.00 for institutions, and $25.00 for individuals. There is no shipping charge for subscriptions in the United States and Canada.